A small plane with three crewmembers crashed in Venezuela in the middle of the week, locals reported to the police. When the National Guard arrived at the scene, they found almost a ton of cocaine scattered across the area. The accident, which happened in the state of Cojedes in central Venezuela, took the lives of all the crew. As yet they haven’t been identified, according to local authorities. The plane came down approximately 250 kilometers from the capital city of Caracas on Wednesday. Pictures of the confiscated drugs were published on Saturday. The National Guard found 863 packages of cocaine at the crash scene, weighing over 999 kilograms. The coke packs were displayed in a long line down the street in front of the guard’s office. The prosecutor’s office has launched an investigation to establish the cause of the accident, and to track down the origin of the illegal cargo, according to the Noticias24 website. The national Air Force is empowered to shoot down drug dealers’ aircraft in Venezuela, whose air space (and territory) is commonly used by drug gangs to smuggle narcotics, especially Colombian cocaine, from Latin America to the US. 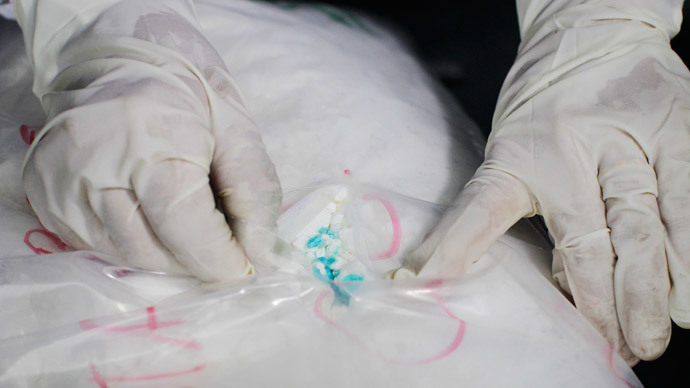 In 2013 alone, the Bolivarian National Guard seized 39 tons of an assortment of drugs.